Amir Ismagulov, father of Azamat Tazhayakov, paid his respects at the memorial for the bombing victims. When Amir Ismagulov heard about the ­Boston Marathon bombing, he called his oldest son in America in a panic. The oil executive did not realize that the 19-year-old college sophomore lived more than an hour away. The sense of security was fleeting. In the next few days, federal investigators would arrest his son, Azamat Tazhayakov, his roommate Dias Kadyrbayev, and another friend on charges of helping to cover for their college friend, Dzhokhar Tsarnaev, as investigators closed in on the suspected bombers in the Marathon attack that killed three people and injured more than 260. Now Ismagulov is waging a one-man campaign to get his son out of jail. He proclaimed his son’s innocence on television, supported him in the courthouse gallery, and visited him in Essex County jail. In a wide-ranging interview this week, the prominent businessman and city councilor in the oil-rich nation of Kazakhstan expressed shock over the bombings. Ismagulov said his son had dreamed of studying in America and “would never hurt” this country. Ismagulov said his relief over his son’s safety turned to fear April 19, when Tazhayakov called him in Kazakhstan, afraid because the FBI wanted to talk to him. “He said on the phone: ­‘Papa, this guy who did the bombing. It’s a guy who goes to school with us,’ ” ­Ismagulov said. Ismagulov said he peppered his son with questions. He had never heard of this friend. Ismagulov said he told his son to cooperate fully with author­ities and pointed out that Tazhayakov talked to author­ities for hours without a lawyer. The next day, April 20, his son was in jail for civil immigration violations, which were postponed when authorities filed criminal charges last week against Tazhayakov and Kadyrbayev. 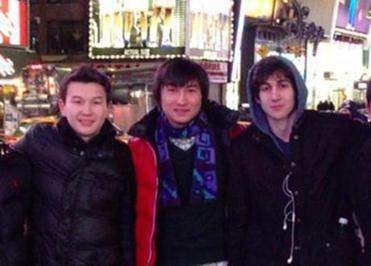 Prosecutors say Kadyrbayev and Tazhayakov and the other friend went to Tsnarnaev’s dorm room at the University of Massachusetts Dartmouth the night of April 18, before Tsarnaev was caught. Authorities have charged Kadyrbayev and Tazhayakov, both Kazakh ­nationals, with obstructing justice and trying to destroy evidence for taking a backpack and emptying out fireworks from Tsarnaev’s room and discarding them. Authorities found the backpack and fireworks in a landfill. The roommates are being held in Essex County jail and face up to five years in prison and a $250,000 fine. They have a hearing May 14, said Tazhayakov’s lawyer, Arkady Bukh of New York. The third friend, ­Robel Phillipos, 19, of ­Cambridge, is out on bail on charges of lying to investigators in a terrorism investigation. Ismagulov also said his son “absolutely” did not know Tsarnaev was the bombing suspect at that time and did not discuss getting rid of the bag with Kadyrbayev. “Azamat said they were asking him this question probably 20 times during the interrogation and [he] kept telling [author­ities], ‘No, we did not discuss it,’” he said. He said he believes his son. “In a Kazakh family, the son never lies to the father,” he said. Prosecutors said that a month before the bombings, Tsarnaev allegedly told ­Tazhayakov and Kadyrbayev that he knew how to make a bomb. His father said he did not discuss that with his son. Ismagulov said his son told him that he met Tsnarnaev through Kadyrbayev, a Kazakh whom he also met when all three men enrolled at UMass Dartmouth in 2011. He said ­Tazhayakov became friendlier with Tsarnaev last year when he began spending more time at their apartment. Unlike Tsarnaev, raised in a struggling household, Tazhayakov attended elite private schools and took trips to the ski slopes and the seashore. Ismagulov, who said he is uncomfortable talking about his personal achievements, said he owns an oil field and a road construction business, as well as a helicopter and homes in two cities. He said he raised his son in a moderate nation. Tazhayakov is the oldest of four children; a brother, 17, studies in England, and an 8-year-old brother and year-old sister live in Kazakhstan. The family is Muslim but rarely goes to the mosque except on holidays. Ismagulov described ­Tazhayakov as a soft-hearted person, “like his Mom,” who loves soccer. Before he was jailed, he called home daily. Tazhayakov had hoped to transfer this year to a Texas university to study oil refining, one of the family’s businesses. “We are a normal family,” ­Ismagulov said. Tazhayakov had no criminal record. To come to America, he had to apply for a visa and get fingerprinted and pass an interview and background check at the US consulate. Tazhayakov’s visa status triggered national debate when it was revealed that he reentered the United States in January on an invalid visa, which was terminated because of his low grades. His lawyers said he later fixed that and had reenrolled in college. Authorities searched the apartment and opened boxes, focusing on one container they feared was a bomb. Instead, Tazhayakov’s father said it held a pet lizard. “I don’t care about business, anything. When my son is in jail I cannot sleep peacefully in Kazakhstan,” he said. 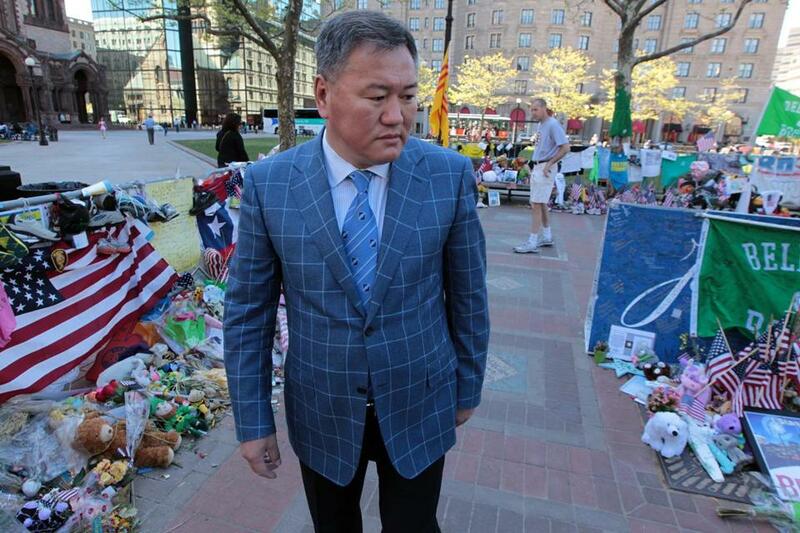 Yesterday, Ismagulov laid flowers at the Boston Marathon memorial to remember the victims.